Hi everyone! I have been really slacking on the blog this week because I'm in St. Louis preparing for our big move in May. We signed a lease, Bob had some job interviews, and I've been getting in some quality family time (and shopping!) I have been busy ever minute, but it's been a lot of fun. 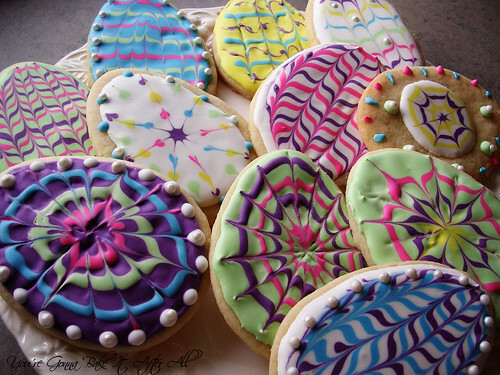 My mom, my sister, and I decided that this year, instead of dyeing Easter eggs we would decorate sugar cookies! 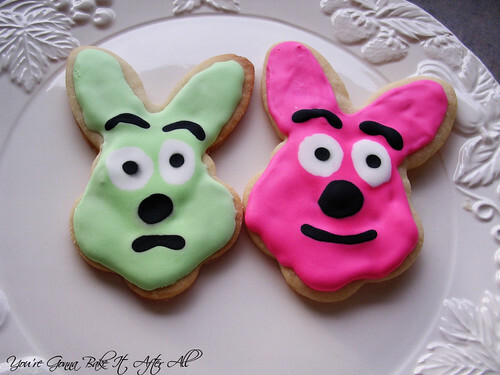 After seeing several posts about Easter cookies, I couldn't resist trying them out. I love the technique of using toothpicks to drag out lines or dots into beautiful patterns. We had so much fun playing around with different designs! 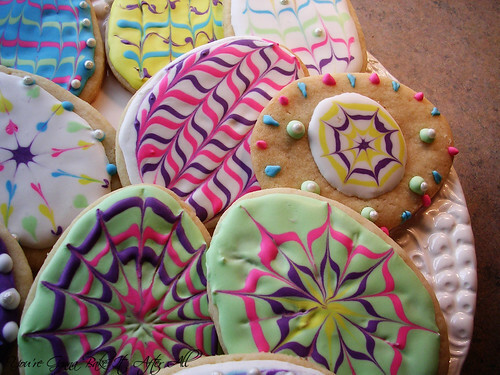 Each time I've used Royal icing (here and here), I used a different recipe for the icing and a different sugar cookie recipe (see a great sugar cookie comparison post here). I keep thinking I'll find one that is better than the last time, but really they all seem very similar to me. 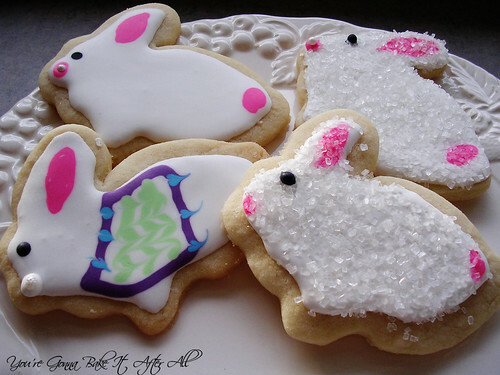 I'll provide links to the recipes I used this time below, but know that these techniques work on any cookie, and I'm sure any royal icing recipe. The one thing I did differently this time was to use only one consistency icing per color and to use it for both outlining and flooding, which were done at the same time, rather than what I've done in the past: outline, wait for it to dry, then flood. When using the same color for outlining and flooding, the outline blends in nicely. Of course this might not work for the Monkey Face Cookies where having a distinct outline is essential, but for these cookies it worked very well. This time, I drew inspiration from a number of different sources. 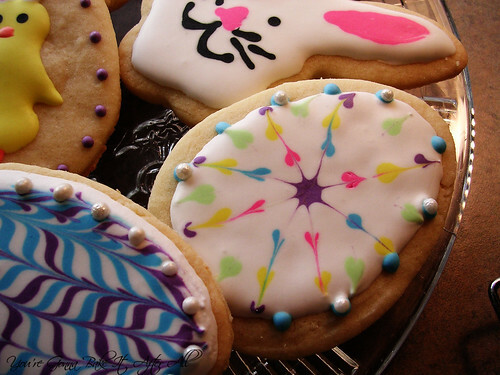 I first saw this post on the King Arthur flour blog about these fun techniques for Easter cookies. 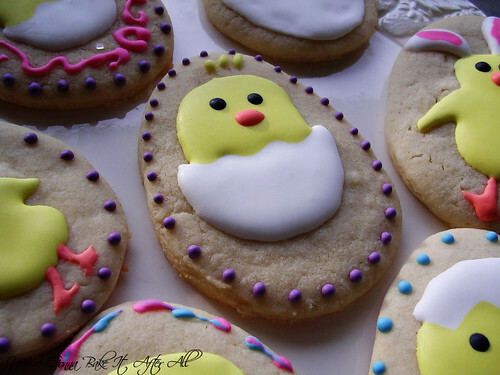 Then I saw a guest post on Bake at 350 from Sweetopia, which led me to other posts at Sweetopia. 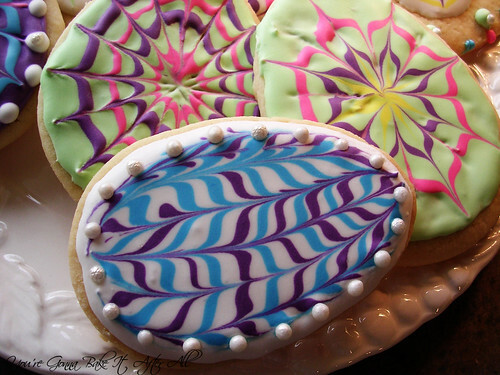 Each of these blogs have some great tips for working with royal icing. 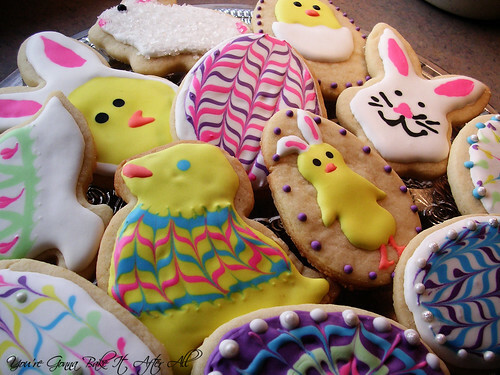 For those of you who celebrate Easter, you still have time to try these out before Sunday - so get to it! 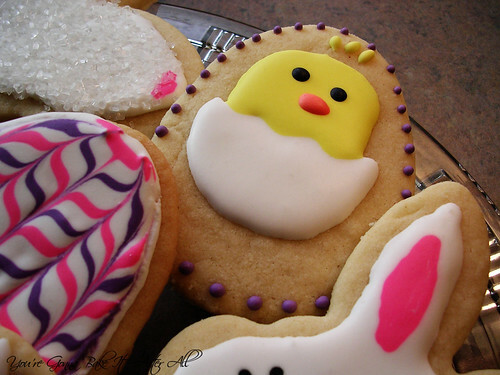 :) Or see the sidebar for some other great Easter treats. 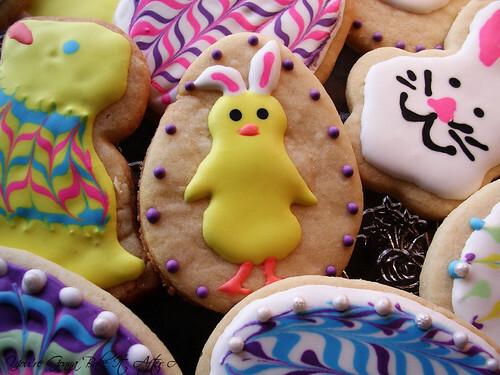 Have a great Easter, Passover, or a nice relaxing weekend! My mom's creation - remind you of anyone? These are so cute! I'm baking with my little siblings tomorrow. Thanks for the inspiration! These are absolutely beautiful! I want you to send me some for my kids. They look amazing! Have fun preparing for your move! so cute! glad you're blogging again - we missed you! but i'm sooooo glad you're having fun and getting to relax a bit! when do I get to come over and eat these? These are so pretty! 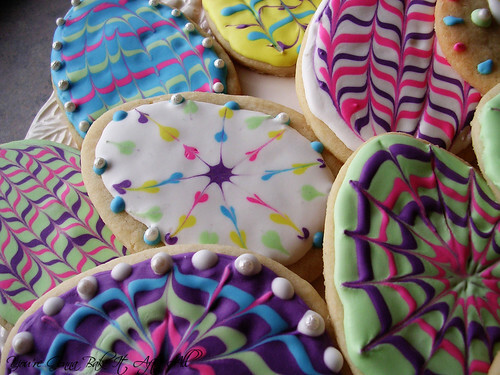 I'm royal icing impaired, I'm afraid, although after Andrew saw these, he's begging to make sugar cookies. I think we'll give it another try. My brother and his family live in St. Louis, Webster Groves, actually. We haven't visited lately, but I remember the parks were especially lovely. These are absolutely gorgeous - beautiful work! How adorable! 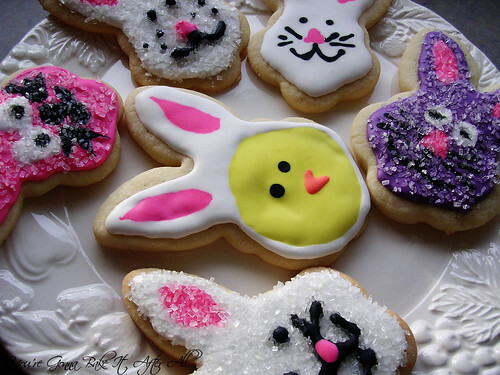 I wouldn't be able to eat them because they are just so cute :) I love how you played with the toothpicks too! Good luck with everything and Happy Easter Meghan! I'm thinking Hoops and Yoyo. 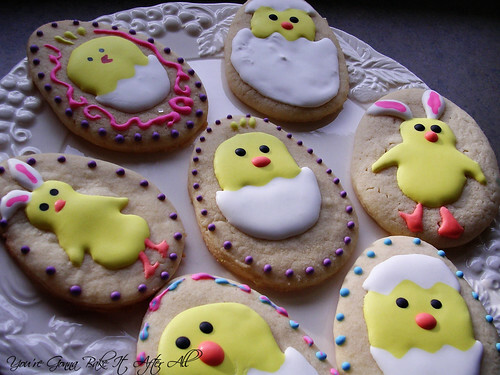 :) Love the chick with bunny ears. These are incredibly creative and beautiful. Happy Easter! These are adorable!! 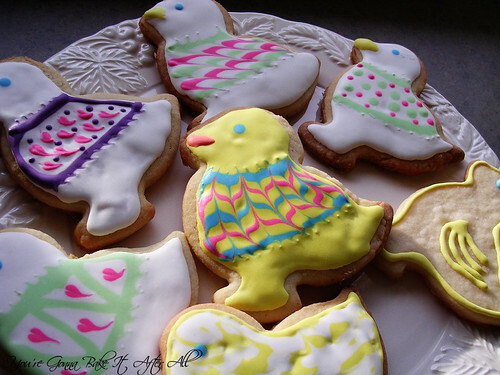 I would love if you would post these on my facebook page please - such cute ideas!! 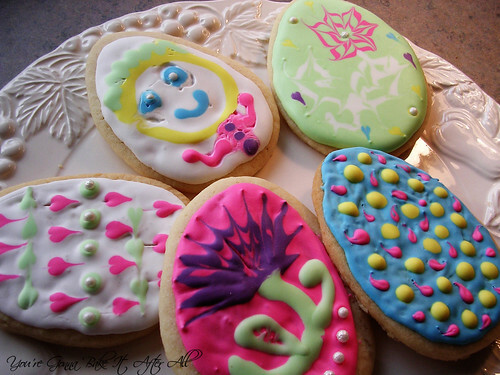 I would much rather decorate cookies than dye Easter eggs too. You did such a stunning job--wow, they look picture perfect. Hope you had a good Easter!